As part of implementing the Agenda 2063, the African Union Commission held its first African Economic Platform (AEP) in Port Louis, Mauritius 19 to 21 March, 2017. The Platform brought together Senior Africa policy makers, Academia, and Business as a means of gaining a collectively owned framework for supporting development in the continent with commitment from African leaders. The dialogue focused on four themes; Skills Development; Expanding Opportunities for Intra African Trade; Industrialization and Regional Value Chains; and Free Movement of People. Three of these themes directly relate to RUFORUM’s thrusts, i.e., Skills development, Promoting academic mobility across the continent and strengthening regional value chains. 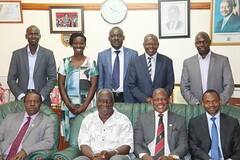 RUFORUM delegation led by the RUFORUM Board Chair and Vice Chancellor of Jomo Kenyatta University of Agriculture and Technology (JKUAT), Prof. Mabel Imbuga represented academia. Prof. Imbuga led the discussion on Industrialization and Regional Value Chains, while Dr Moses Osiru, RUFORUM Deputy Executive Secretary, participated in the session on Skills development and free movement of people, a theme that directly relate to the RUFORUM initiative on promoting academic mobility across the continent through the RUFORUM Graduate Teaching Assistantship programme (GTA) and the Regional Centres of Excellence. The GTA was established by RUFORUM Vice Chancellors (66 from 26 African countries) to increase the pool of PhD trained staff by training their staff in other RUFORUM member universities. Under the GTA arrangement the receiving university waives fees and provides accommodation for the academic staff from another university, while the sending university pays for upkeep and research of its staff under training. The programme aims to train 325 PhD staff over the next five years. His Excellency Moussa Faki Mahamat, the newly appointed AU Commission chairperson welcomed the initiative of the African Economic Platform as it will facilitate the implementation of the Africa Agenda 2063 framework. “We can reach that tipping point of sustained growth and transformation”, he said. During the closing ceremony, Prof. Adipala Ekwamu, the Executive Secretary of RUFORUM thanked the African Union for setting up the Committee of 10 African Heads of State to champion Education, Science and Technology development in the continent under coordination of His Excellency Macky Sall, President of the Republic of Senegal. The Committee of 10 Heads of State will meet in Malawi in June 2017 at the invitation of His Excellency Professor Arthur Peter Mutharika, President of Malawi, and the meeting will involve academia, private sector leaders and other High Networth persons. Above from Left to Right: Prof. Amadou Tidiane – Vice Chancellor of University Sine Saloum El hadj Ibrahima NIASS (Senegal), Dr. Moses Osiru- Deputy Executive Secretary of RUFORUM, H.E Dr. Ameenah Gurib-Fakim President of Mauritius, Mr. Tony Elumelu-African Philanthropist (Nigeria), Prof. Mary Okwakol- Vice Chancellor of Busitema University (Uganda) and Prof. Adipala Ekwamu-Executive Secretary of RUFORUM at the State House meeting in Mauritius during the AEP Week. In his vote of thanks, Prof. Adipala Ekwamu urged African Governments to increase investments in Higher Education in Africa and to provide an enabling environment for private sector engagement to support Africa’s development. He further urged the private sector to engage with African Universities to support their business research, and to help the universities train for the market. He further noted with appreciation efforts of Mr. Tony Elumelu’ s Foundation to skill 10,000 young entrepreneurs and creating over 1 million jobs for Africa.